In 2017 the National Motor Museum launched Bush Mechanics: The Exhibition. The exhibition has traveled across Australia, including a stop in its home town Yuendumu. 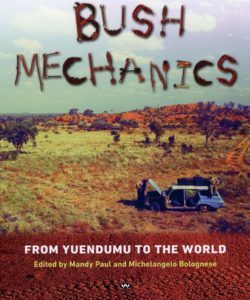 This book explores the history and continuing appeal of the wildly popular television series Bush Mechanics that aired on ABC from 2001-2002. It goes behind the scenes to discuss the highs and lows of life in the Australian outback and the influence of cars in Aboriginal communities. Edited by the director of the Migration Museum, Mandy Paul, and the National Motor Museum’s senior curator Michelangelo Bolognese, this book includes contributions from Associate Professor Georgine Clarsen (Wollongong University) and David Batty (director of Bush Mechanics) among many others. Aboriginal and Torres Strait readers are warned that this book contains images of people who are deceased. This book is available for purchase at the Museum shop for $29.95.